Generally, it is assumed that cracks are due to some problems in the foundation, whereas it is not always correct and should not be considered failure of structure or improper design or bad quality work. Generally, 1/16 to 1/4-inch-wide cracks is acceptable limits. The American Concrete Institute as per ACI 302.1-04 addresses this issue, even the best construction & concreting cannot prevent cracking in concrete, and 0% cracks is an unrealistic thing. Many mixtures with rapid setting and strength gain performance have an increased shrinkage potential. 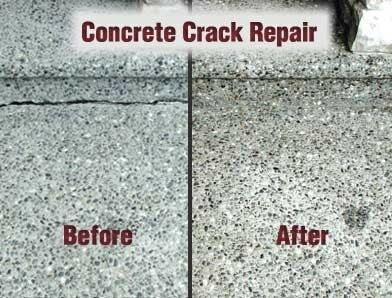 How to Prevent Cracks in Concrete Structures? A low water cement ratio will affect the quality of concrete. W/C ratio is weight of water to the weight of cement used. A lower w/c ratio leads to high strength in concrete and lesser cracks. Concrete expands and shrinks with changes in moisture and temperature. The overall tendency is to shrink. Shrinkage is the main cause of cracks, when concrete hardens it evaporates the excess water and thus shrinks, so lesser the water content, lesser is the shrinkage. Cracking shrinkage in slabs is ½ inch per 100 ft. The shrinkage of concrete pulls the slab apart showing it as cracks on surface. The concrete itself must be properly proportioned, and properly mixed. If you use too little cement, you can almost guarantee cracks. Using too much water will make the concrete weak, leading to cracking. Use good quality aggregates so will produce lower shrinkage concrete. Hard, dense aggregate, using a large top size aggregate and optimizing the gradation of the aggregate is able to reduce the shrinkage of the concrete. If the aggregate is of poor quality, maximizing the size, gradation, and content may have little effect on the concrete shrinkage. Mixing large aggregate with poor qualities to a mid-size aggregate with good properties may increase the shrinkage of the concrete. Avoid the use of shrinkage-promoting admixtures (such as accelerators, dirty aggregate which increases water demand and using a cement with high shrinkage characteristics. 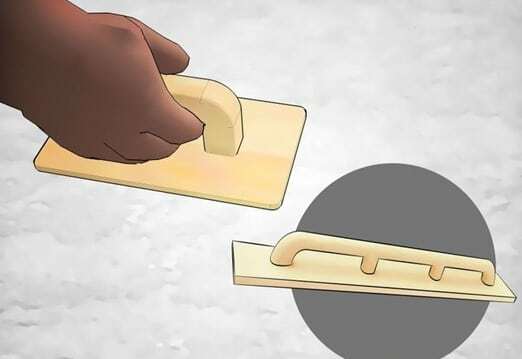 Use proper finishing techniques and proper timing during and between finishing operations. Flat floating and flat troweling are often recommended. 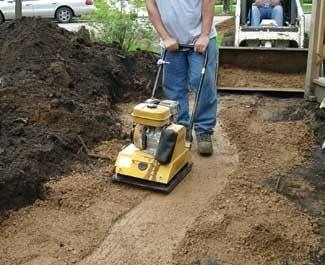 Avoid overworking the concrete, especially with vibrating screeds. Overworking causes aggregate to settle and bleed water and excess fines to rise. Don’t finish the concrete when there is bleed water on the surface, finishing leads the water back to concrete instead of evaporating thus leading to cracks. Stop rapid loss of water from surface or drying of concrete due to hydration (liquid concrete converts to plastic and then to solid state) causes drying of the slab, so it’s recommended to cure the slab for several days. As soon as the concrete on slab sets its general practice to make boundary with mortar on the slab and keep it filled with water. 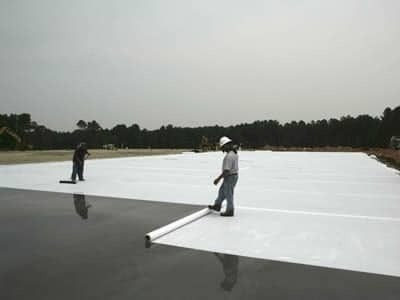 Cover slab with cotton mats soaked with water or spray on a curing compound also prevents loss of water. 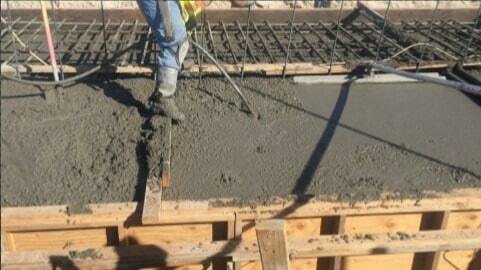 The concrete should not be subjected to load during the curing period, which can last up to one month. 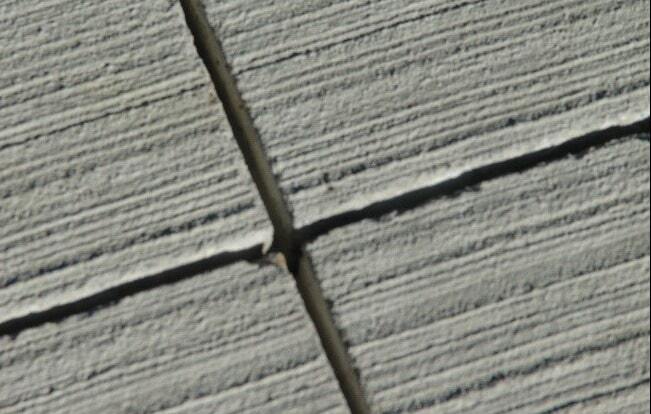 Properly placed, vibrated, finished concrete reduces the chances of producing cracks. Properly vibrate to release entrapped air which later leads to cracks. The area below the concrete slab has to be compacted properly and in layers so as to ensure against settlement of soil later. If the soil is left loose it will settle over time and create cracks on surface. This applies in the home as well as constructions on highways. Control joints should be located at regular intervals so as to adjust the shrinkage of concrete. Generally, for 4-inch depth of slab joints are provided 8 to 12 ft. apart. Control joints are pre-planted cracks. An engineer should have an idea that concrete will crack at control joints instead of cracking any other location. Prevent extreme changes in temperature. 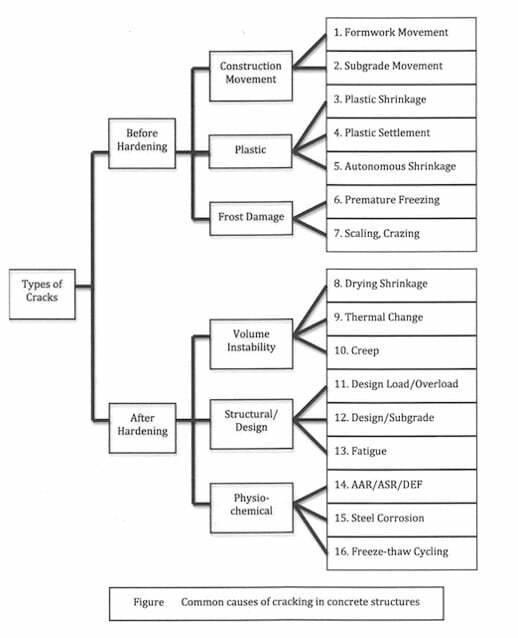 Consider using synthetic fibers to help control plastic shrinkage cracks. To summarize, always prevention is better than cure. Prevention of concrete cracks give good quality, saves time, money and peace of mind to the owner.